Used balers recycle cardboard, paper and plastic. Designed to work in small spaces, balers are operated by one person saving both time and money. Easy to maintain, used balers have a side-mounted power unit and a one-touch button to operate. 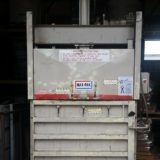 Loose material is loaded from the side or top depending on the baler style. The material is accumulated and compressed into a bale. The finished bale is bound by wire, plastic, or string. Reduce disposal costs and save money. Maintain a clean and safe warehouse while creating a new source of revenue for your company.